The Bowes Museum’s ‘Coastal Scene’, attributed to Joséphine Bowes, clearly depicts a coastline that is likely to be recognisable: the jagged cliffs towering over the sea are ridged with chalk layers, their peaks making distinctive patterns – although such natural features may be eroded since c.1860–1874, when the scene was painted. 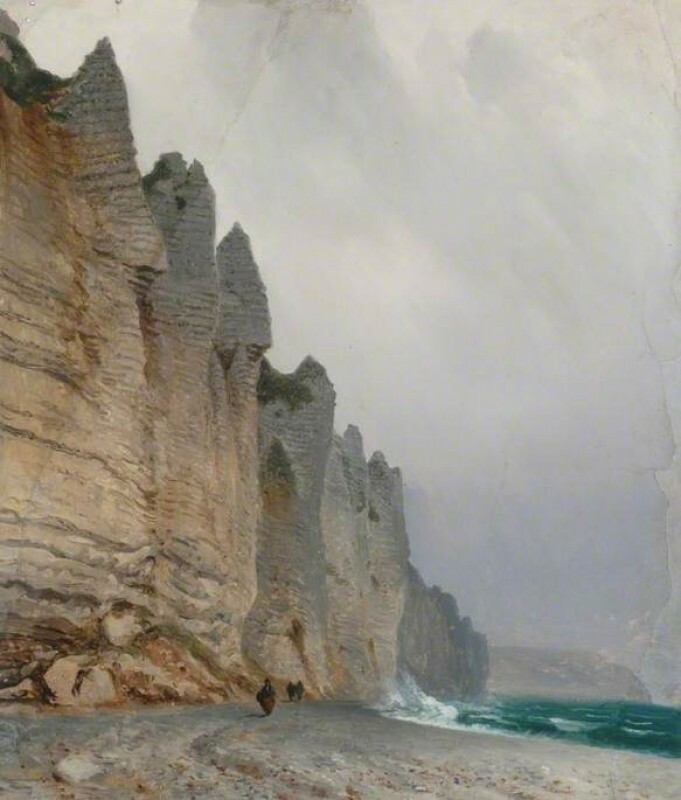 Pieter van der Merwe proposed that the view is of the Channel cliffs near Étretat, in north-western France, and drew comparisons with the spectacular cliffs painted in 'The Sea Arch at Étretat' by Gustave Courbet during 1869. Could someone with specific knowledge of the Étretat area provide evidence to confirm a location? Many suggestions were given. Patty Macsisak thought Quiberville-sur-mer (east of Étretat), while Pieter thought the cliffs were more likely to be between Quiberville and La Poterie-Cap-d'Antifer. Frances Fowle was able to post photographs she had taken of the cliffs at Étretat from the Manneporte, looking farther up the coastline. Patty also gave links to images of Varengeville-sur-mer, and Vasterival beach (just west of Varengeville, in the direction of St Marguerite-sur-mer), which looked hopeful. It was decided that the scene could at least be said to depict cliffs on the Normandy coast in northern France (though Varangeville or St Marguerite, west of Dieppe, rather than Étretat, seem more likely). The collection changed the title to: 'Chalk Cliffs (probably in Normandy)'. Do you recognise the exact spot shown in this painting? If so, please do propose a new discussion via the artwork page on Your Paintings. Editor’s note: this change will appear on the Your Paintings website by January 2016. Is this 'Coastal Scene' in Étretat?